Vancouver is a nature lover’s and cycling paradise. Hugging the coastline of the north Pacific and edged with towering snow-capped mountains, it’s hard to resist getting active during your visit to this vibrant West Coast city. 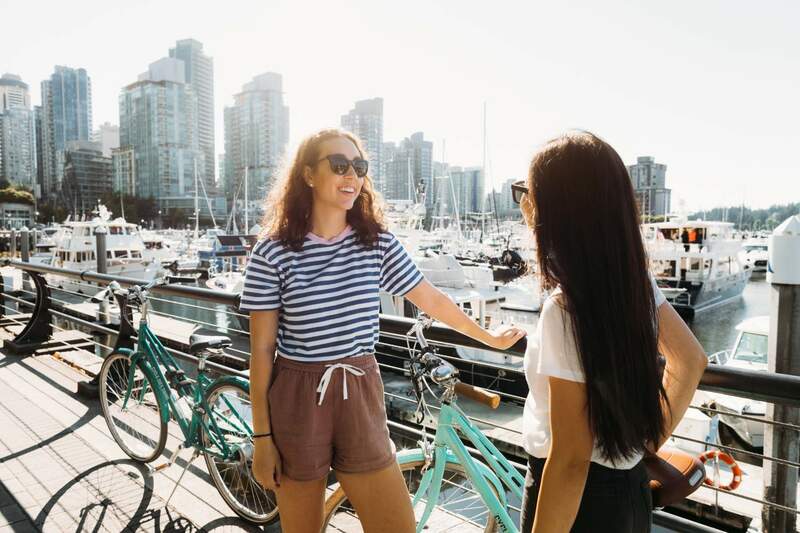 Hop on a bike to experience the best of Vancouver, the city makes it easy to get out and cycle with well-marked and plentiful trails for all kinds of biking. Choose your speed, easy, medium and hard with our top picks for a glorious day of biking in Vancouver. 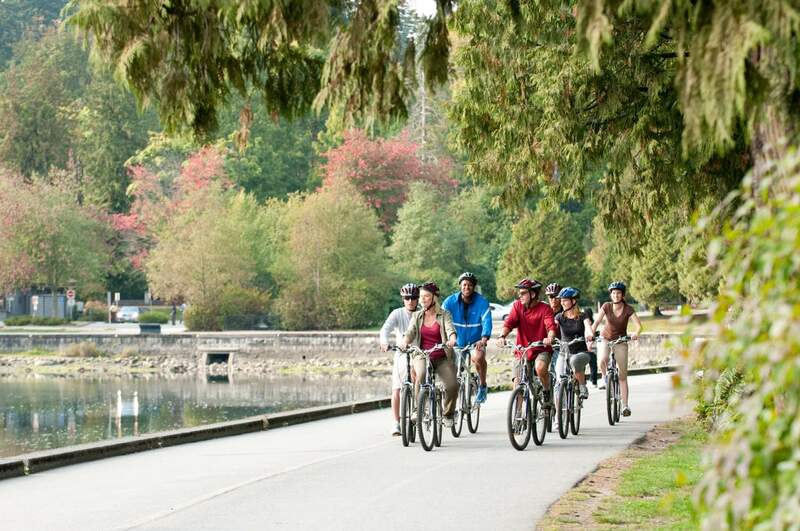 The Stanley Park Seawall Bike Trail is the obvious choice when heading out for a Vancouver bike ride. The path is a relaxing 10km circular route around the park, and while it may be easy, the seawall trail will probably be one of the most beautiful rides you will experience in Vancouver. 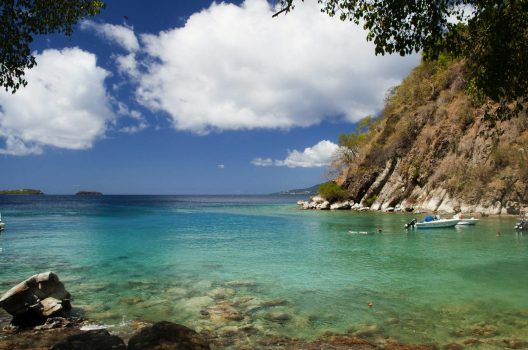 Stanley Park is a 400-hectare nature oasis conveniently located in the downtown area of the city, and it is almost completely surrounded by the ocean, what a perfectly splendid way to spend a day on the West Coast. Rent a bike from Spokes Bicycle Rentals, located about five minutes from Stanley Park on W. Georgia Street, and start your ride on the Coal Harbour side of the park, this also ensures you’ll be riding the correct counter-clockwise direction on the separated bike trail. Be sure to visit the Brockton Point Lighthouse, take in the beauty of the totem poles and keep an eye for the Girl in a Wetsuit statue during your ride. Stop for lunch or some locally made Rocky Point ice cream at the Prospect Point Café. The café is located about halfway along the seawall trail and offers a large patio with a great view of Lions Gate Bridge. We loved the Earl Grey ‘n Honey ice cream, so very yummy and a perfect treat for a hot day on a bike. Afterwards hop back on your bike and head to Third Beach where you can cool your toes in the water before you make your way back to the English Bay side and the end of your day in this gorgeous Vancouver Park. If you’re looking for a wee bit more of a challenge on your biking day out head out to newly extended Spirit Trail, a 35km bike and pedestrian path in North Vancouver. Rent a bike at North Vancouver’s Endless Biking, which is located about a 5-minute bike ride from Spirit Trail at the bottom of Sunrise Park via Heywood Street. If you want a shorter ride you can hire a bike from a downtown rental shop and then take the sea bus from Waterfront Station to Lonsdale Quay where you can pick up the trail along Chesterfield Place. While at the Quay you can quench your thirst with a sample of craft beer from Green Leaf Brewery or bike over to Butter Lane Bake Shop for almond croissant, bliss. Be sure to pick up some picnic munchies from the Lonsdale Public Market to take with you on your Spirit Trail bike ride through North Vancouver. 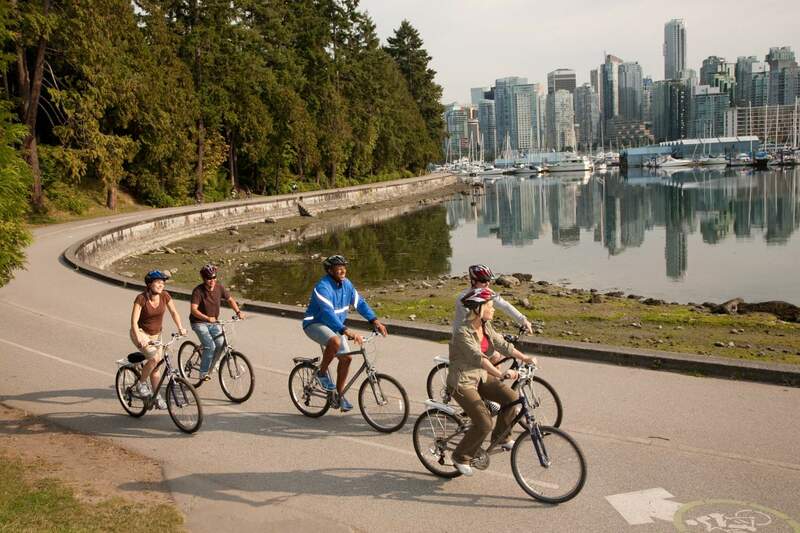 The ride along the Spirit Trail provides cyclists with amazing views of the Pacific Ocean on a greenway path as well as a great tour across North Vancouver before ending at Ambleside Park. You can watch out for the many public art installations along the trail, drool with envy at the floating homes in Mosquito Creek or see if the seals are taking in the sun near the Burrard Yacht Club, you can even stop to do some shopping at Park Royal Mall. 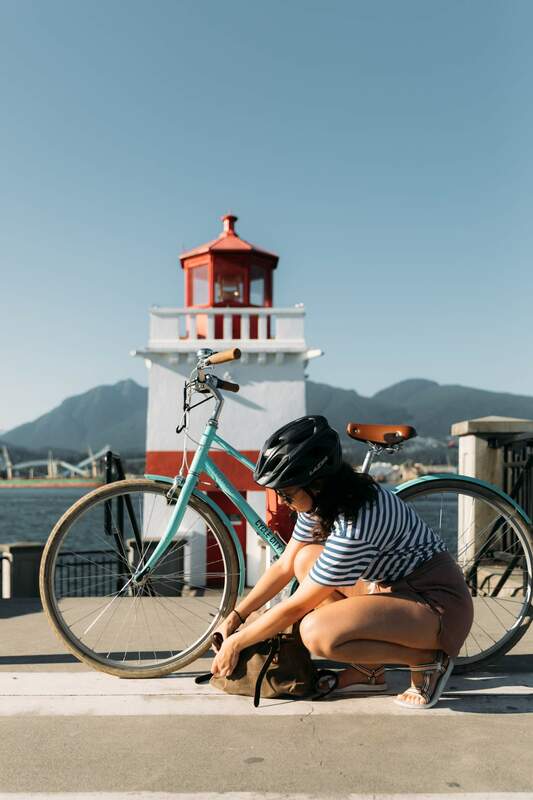 Once you reach the end of the ride at Ambleside Park, get off your bike and amble, relax with a picnic or just sit and enjoy the gorgeous views of Lions Gate Bridge and Stanley Park before heading back home. If you want to work on your hill climbing while in Vancouver, this is the ride for you. Cycling up Cypress Mountain to Cypress Mountain Ski Resort gives even experienced cyclists a challenging ride. The route may only be about 12km in length but with an average grade of 6% you will feel every kilometer. Fortunately you can take a break about 5 km up the mountain at the First Peak Lookout where you can rest your weary and aching legs and enjoy seeing all of Vancouver laid out at your feet. Hop back on your bike and pedal steady until you reach the Lodge where you can stop for rest and a water break before the exhilarating ride back down to the city. The ride up and down Cypress Mountain is shared with cars and so we would recommend it for experienced riders only. If you prefer to do your biking sans cars sign up for the Cypress Challenge held each August. The bike event is hosted by Glotman Simpson Cycling and raises funds for pancreatic cancer research. After completing this energetic mountain climb, point your bike towards Temper Chocolate and Pastry in nearby Dundarave and gorge yourself on one or two or many brioche donuts, you’ve earned it! 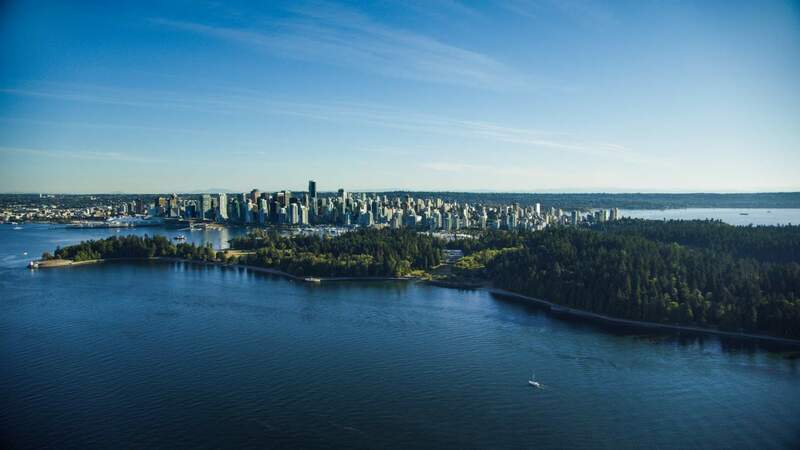 There’s so much to see and do on a trip to this bustling city on Canada’s West Coast so put a visit at the top of your must-do list! 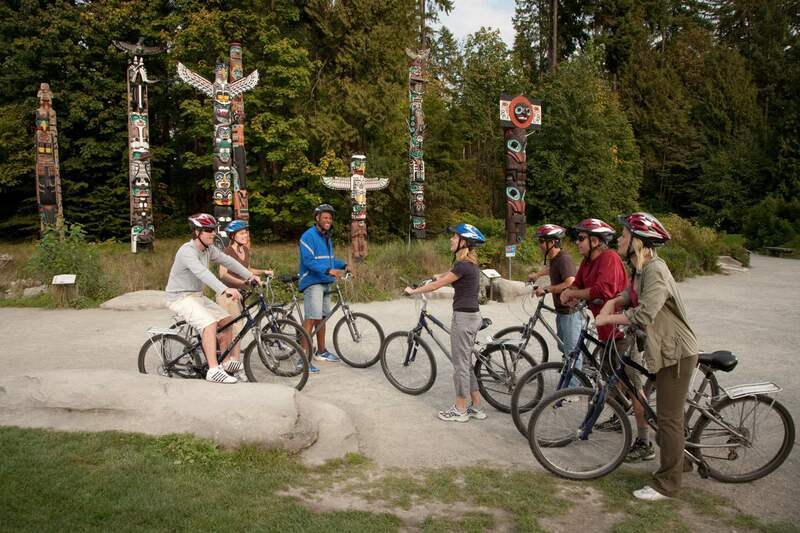 Start planning your active bike adventures in Vancouver today with flights from Air Transat.